Our garden team has kicked off the planning process for our transition to the Wilson Pacific site. With our exceptional Garden Educator, Rowan Lang, we have identified the requirements for the garden, and have done a preliminary site analysis (as much as we can do without physically being there). This week, we presented our ideas to the PTA Board and were warmly received. Staff and parents want to make sure our kids have time to dig! Below, we summarize the powerpoint [[19 MB PDF]] that Grace created to show what we are hoping to accomplish at the new site. She has already begun meeting with school district representatives in order to finalize the design in time with plenty of time for the transition. We need your help in making sure the garden is installed as quickly as possible at the new site! We are forming our transition committee now and will hold the first meeting in early March. Fill out this doodle poll if you would like to attend, so we can find out a good time to meet! Please email KimberlyChristensen@live.com with any questions. Sense of belonging and connection. The garden has familiarity and fosters a sense of attachment and place. It has a variety of enclosed and public spaces for private and open exchanges. Movement and exercise. The garden supports low-impact activities, including walking, wheeled mobility, gardening, play, formal exercise, and physical rehabilitation. These activities build strength, reduce stress, and elevate mood. Sensory nourishment. The garden offers heightened interactions with nature through the senses. Natural distractions improve emotional states, diminish troublesome thoughts, and foster positive physiological outcomes. Sense of control (actual and perceived). The garden allows individuals to make choices. It provides a temporary escape, a sensation of “being away,” an opportunity for the user to gain control of his or her emotions and refocus attention. 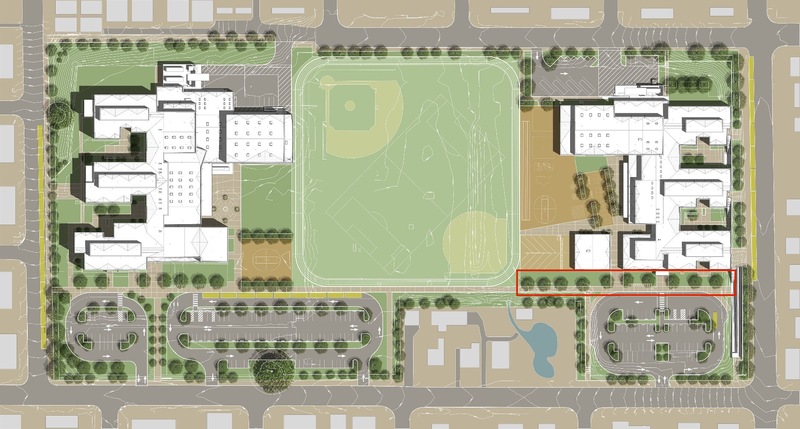 The BEX-IV (Building Excellence) Seattle levy funded $110M to replace aging elementary and middle-schools on a 17-acre site in Northwest Seattle, scheduled to open in the Fall of 2017. 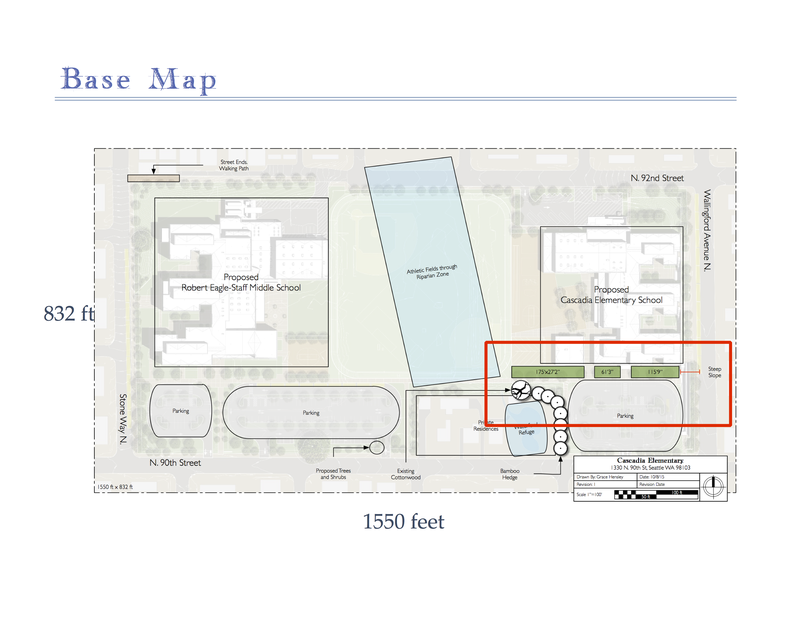 Cascadia Elementary, a 780-student elementary school spanning 1st through 5th grades, serving the Highly Capable Cohort (HCC), will occupy the elementary school at this site. 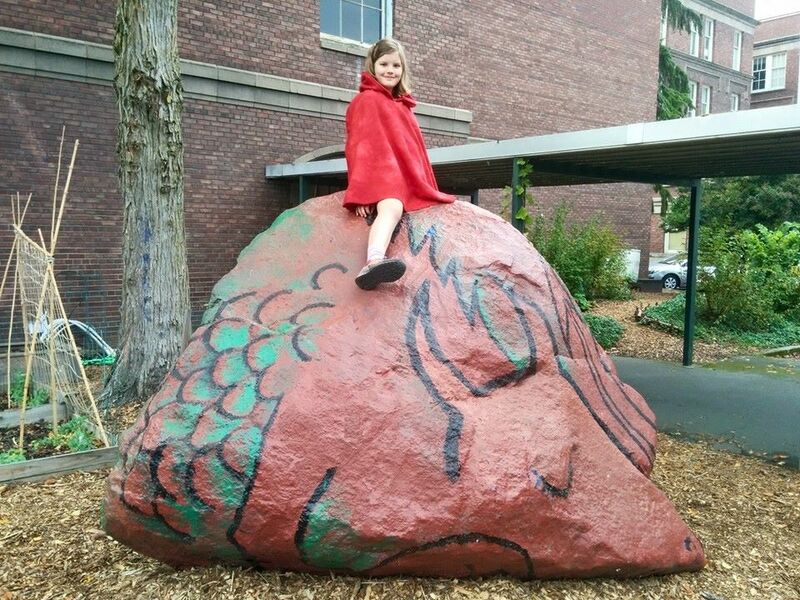 The SNAPP-Dragons school garden program founded at Cascadia Elementary will move into a new Garden Maker-Space to integrate classroom requirements with local watershed and community interests. To do incorporate all of these things without having specific single-use zones, we have decided to create a “Maker Space”. Maker-Spaces provide a place for a community to share expertise, tools, and materials to create something new with a wider impact than what could be made by someone working alone. Our Garden Maker-Space enables us to teach all elements of curriculum from literacy and art, to math and science using observation and manipulation. The Garden provides an opportunity to explore concepts in ways that can not be done indoors. Grace recently completed a Permaculture Design Course to use as a framework for designing the site to fit into the environment. Permaculture designers start from the macro scale and work towards the details. We start with the watershed. 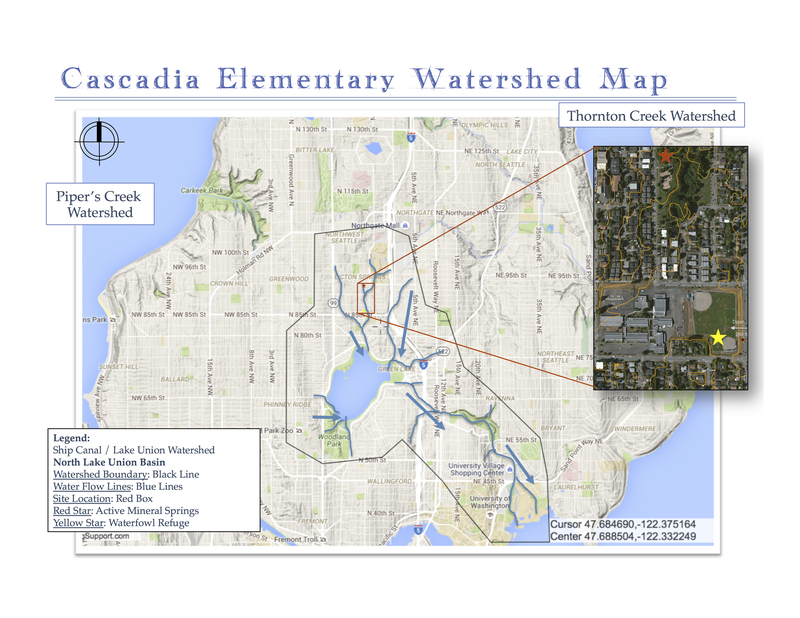 Cascadia is part of the Thornton Creek Watershed. Rowan and Grace visited Pilling’s Pond last fall and were delighted to be invited on a tour of the site. David Kunkle mentioned that he has seen river otters in his duck pond, which clearly have come up the Thornton Creek, through the North Seattle Community College wetlands and then into the Licton Springs drainage. Below is a map of our site in relationship to the active mineral springs at Licton Springs Park. We would like to capitalize on the possibility of using Pilling’s Pond as an additional learning opportunity. We are also aware of the impact of the wetlands and seasonal flooding issues [Video], and want to ensure our garden does not impact anything downstream. During the construction process, a 4-ft culvert has been installed to divert the flooding under the athletic fields; without it, they would be on a riparian zone! We sit on a level shelf, that drops precipitously into Pilling’s Pond. The pond (and the wildlife) are protected by a barrier of bamboo to its Northeast, between the school and the pond. The bamboo will have no impact on our garden. The only other issue is a large poplar tree that can potentially shade our site. Then, we drill down to look at any impacts. Here, this map shows the solar aspect (orange and yellow), the winter storm (purple) and drainage (blue) directions. Of most importance is the entrance zones for the school and community (red) and the daycare (pink), and the location of the Administration offices (black). We will want to encourage the community to walk by the garden without actually coming in, or picking food. Good signage about what we are growing and how to be respectful will be effective. The access to the daycare will mainly be through the west building, but we need to keep a wide path clear for annual delivery of woodchips for the playspace. 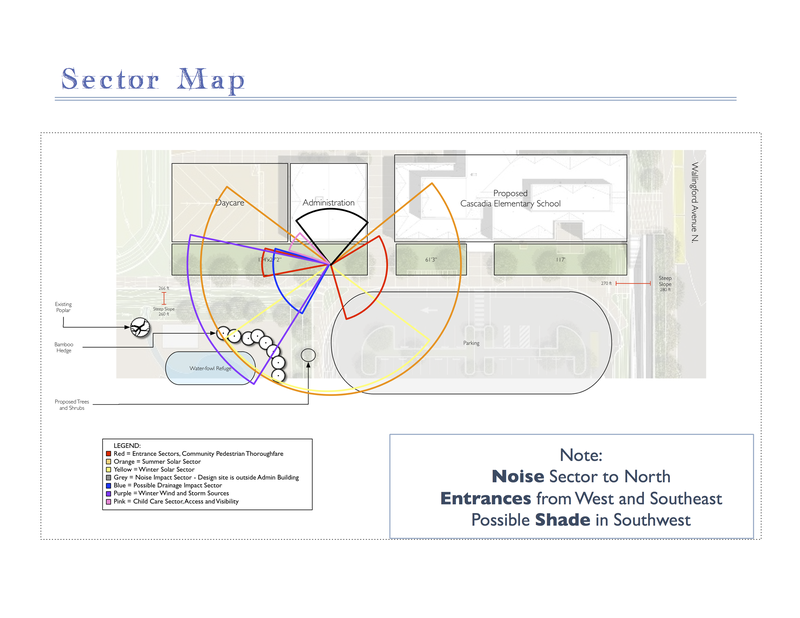 We want to ensure that the noisiest parts of the garden-usage will not be centered next to the Admin offices or classrooms. We also have a responsibility to keep the garden looking tidy, as it is the first impression for all visitors to Cascadia. While we’re still working out the details for all of the elements, here are some proposals for some of the spaces. 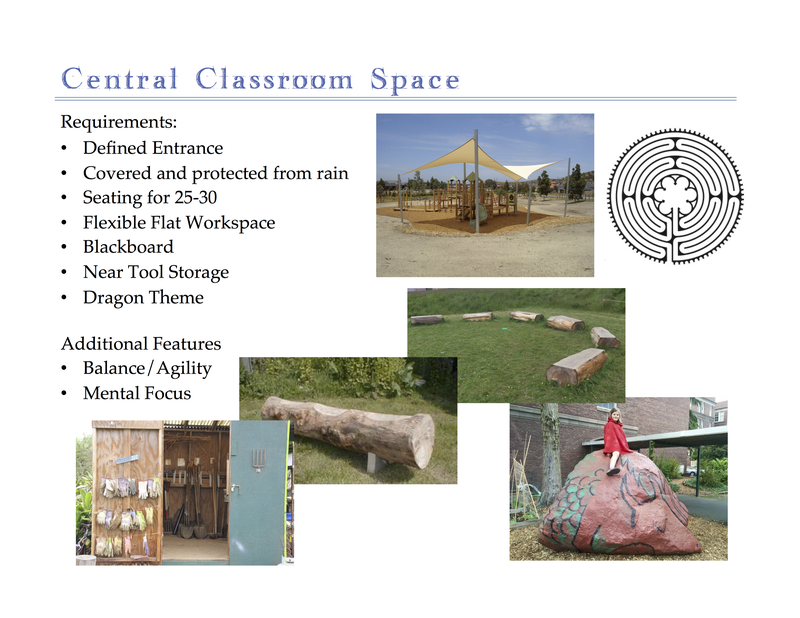 The Central Classroom space should be covered for wind and rain shelter. I hope to have it paved, so there is a flat workspace that could be used for a variety of activities. The paving could be in the form of a labyrinth, perhaps with a dragon’s head at the center. Walking a labyrinth calms both mind and body, and seeing the whole of it helps children visualize patterns. By encircling the central space with recycled timber seating, you get the dual purpose of balance and agility, as well as a centralized focal point for leading lessons. A toolshed can be painted with blackboard paint so you can write up the lesson-of-the-day. It also keeps gloves and trowels and clipboards organized. It would be great to encircle the seating with additional shrubbery for a low-maintenance enclosure. All of it creates a calming and coming-together space that is flexible for many uses. Depending on the total space allocated, there are many ways to organize the desired elements. We hope to have a fruit-tree hedge to define the space and provide food production. This would be well signed to tell the community what we are growing, and invite them to participate in the garden. A central water feature is desired so that children can envision the water cycle from pump to flow to watering-can to plant. A cistern underneath would capture any spillage and recycle it. The physical effort of pumping water reinforces the effort native cultures need to use to transport water to their village, and will strengthen the connection to the environment and the preciousness of water. Raised beds for annual fruit production should be placed for maximum solar exposure. Perennial food crops can be inter-planted with the boundary hedging. The use of native trees and shrubs is encouraged so that they will survive without watering during our dry-summer months. Composting woody material can take place between compost fences designed to separate sections of the garden. This will also feed the soil. A drought-tolerant perennial garden can be planted at the entrance to be used for bird, bug, and bee observations. We are still working with the district and the “Self-Help” requirements so elements are in flux. We would be delighted to hear your suggestions about other elements to include or different ways of thinking about the space. Can we use the full front area? Can we reduce boring/shading “Landscape” trees in front of growing spaces, and choose dwarf fruit trees instead? Can we dig a hole for the water pump cistern? Are we permitted to install structural posts for rain/shade shelter? What is our maintenance plan to ensure site, fruit trees properly maintained? What is our exit plan to return site to grass if necessary? Please! This design is still in development. We would love to hear your thoughts and suggestions. We would love to have you help Rowan and her interns in the garden this spring. We will definitely need help fundraising, obtaining materials, and constructing the new site. Detailed ideas can be emailed to us, and you can always comment here on this blog!